I’m not having a Christmas tree this year. There, I said it. Typing that sentence out practically had me breaking out in hives, because Lord knows I love Christmas. But this year, it’s a no bueno when it comes to the tree. Putting a tree up is actually my favourite part of the entire silly season. During this event, my partner usually leaves the tri-state area as I begin the festivities. Usually a glass of bubbles is poured (anything bubbly, I don’t care if it’s passion pop), the Kylie Minogue Christmas album is pumping, and I set about getting the tree out of its box and playing with all of the ornaments. I never took to the concept of a real Christmas tree. Probably because I wasn’t brought up on them. Add to that my inability to keep anything green alive and you have a perfect recipe for a plastic Christmas tree that lasts decades. I also hate the idea that you just chuck the dead, lifeless body of the tree away a week after the 25th. Like Dexter would an unsuspecting serial killer. Not cute. Anyway, this year there shall be no tree. And it breaks my heart a little. There is a valid reason why there shall be no tree, and I’d like to introduce you to her and explain the story below. This is Emi. She has been my cat for six years. But for some reason, last year she was particularly out of control when it came to the Christmas tree. I liken her to a cross between the Tasmanian Devil from Looney Tunes, and Britney Spears performing Gimme More at the MTV VMA’s when she had the bad weave and blue contact lenses. Yes, that’s exactly how Emi was last Christmas; a girl gone wild. I don’t know why she chose last year to lose her mind, but she did, and she took to pulling every bauble and ornament off the tree – all day, every day. It would start with her rubbing her face on one of the branches. She loves to rub her stank on things. Then it went to her giving a few of the leaves a little nibble. And then, moments later, she was knocking baubles off and chasing them around the house. They’d roll for miles across the hardwood floor, and she was in her own private (and very destructive) heaven. I know what you’re thinking; SELL THE CAT. But we have a bond I cannot break. I am Sigourney Weaver in Alien and she is my Newt. So the cat has to stay. I, on the other hand, was having my own Britney moment. But mine was the ‘shave your head and throw umbrellas at cars’ Britney experience. That cat had me in a meltdown last year that saw me take all of the baubles off the tree at 10.30pm one evening when I’d had enough of my creation being torn apart. Now I know how the contestants on Project Runway feel. What I was left with, as you can imagine, was a bare Christmas tree. Which is pretty ugly. But that’s what Emi drove me to do. My partner thought I was a bit nuts of course, and I probably was. But what other option was there? The cat wasn’t responding to my screaming, my attempts at luring her away from the tree, or my spraying her with the water bottle. In fact, she had become so used to the water bottle trick that it was just like a scene from Terminator. The one where the liquid terminator gets shot, looks at the bullet hole, watches it close up and proceeds as normal. That was Emi. And so that was clearly no solution. So this year, there shall be no Christmas tree. And I’m currently in the middle of a conundrum of how to make my home feel festive sans tree. I know what you’re thinking; SELL THE CAT. But we have a bond I cannot break. I am Sigourney Weaver in Alien and she is my Newt. So the cat has to stay. Now I just need to figure out some alternatives. Which is where I’m hoping you’ll come in. Care to share some ideas in the comments below on how I can either keep the cat away from the tree, OR make the place look festive without a tree at all? My festive destiny is in your hands. Check it out: Images in this post come via The Doors of Berry, who can make you amazing Christmas wreaths for the silly season. They also run workshops on how to make your own which are well worth checking out. 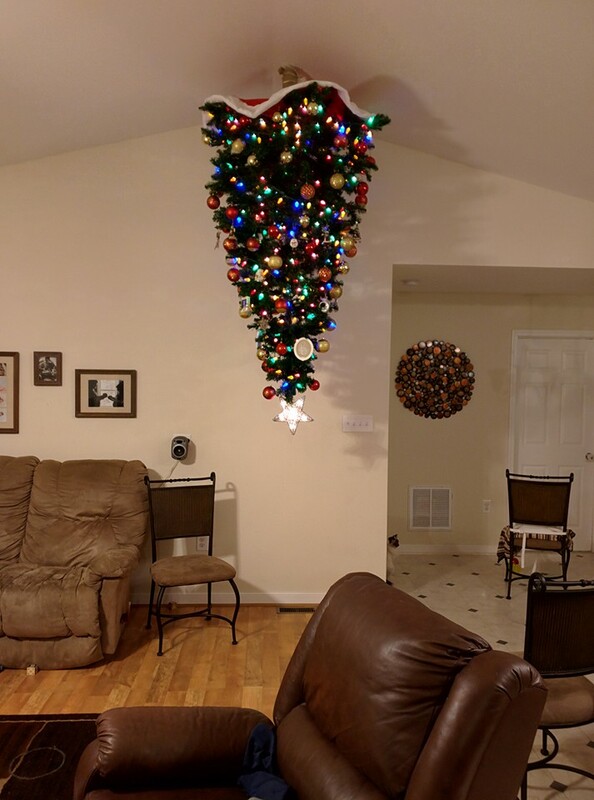 Google “christmas tree on the ceiling” ha ha or have a tree outdoors. We had a baby this year and were planning on having our first Christmas tree. Not so sure and more, our demon cat will go mental! haha cats are just the worst for trees and plants of all kinds May. So destructive. I absolutely love this article, will link to it on my blog sometime soon. Thanks Cath! Let us know if you do. If you can be bothered, a suspended ornament Christmas tree seems like a good idea if she usually only goes for the bottom ones. I’ve also seen where you put your decorations and lights in a tree pattern on the wall. My cat jumps on the tree. I have to find ways around that. I’m going to try putting it up without decorations early so the novelty hopefully wears off! Try an Ikea Fabric print tree that hangs on a wall, great value for $28! Where is your mirror above your fireplace from?